FamLoc displays info on Charlton History Books, and provides the facility for buying them online. 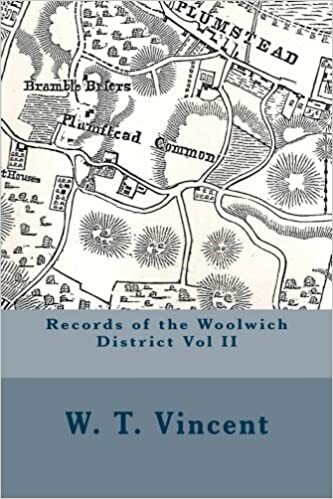 The Records of the Woolwich District, vol II, originally published in 1890, and recently republished by FamLoc, has much information on Charlton, and is an important asset for local and family historians. It is available in print and ebook format. There is also History of Charlton by John G. Smith, published in the 1970s, which is out of print but available from third-parties via our Amazon link. We are trying to contact the author or descendants for permission to republish it, and welcome information. At the Conquest – A Royal Manor – The Name – King James and Sons – Prince Henry and his Tutor – The Prince and the Butcher – Prince Henry’s Wit – The Old Church – The Charlton Estates – The Wilsons of Old – The Wilsons of Today – Charlton House – A Roman Relic – Cypress Trees – Legends of Charlton – Horn Fair in the Olden Time – The Name of the Fair – Horn and Ladle – Another Source – Evil Prosperity – The Safest Theory – Suggested Source of the Legend – Corniculate Masonry – The Later Years of Horn Fair – The Fair Removed – Cadets’ Riot – Colonel Drayson’s Tale of Horn Fair – The End – Charlton Green – Old Sketches – Its Fate – The First Slice – The Last Morsel – A Curious Picture – Cage and Stocks – The First and Second Rectories – The Third Rectory – Cherry Orchard – Royalty at Charlton. H.R.H. Princess Louise – The Story of Queen Caroline – The Roupell Estate – The Great Chalkpits – The Old Church – Monuments – Two State Tragedies – Dr. Charles Hutton – Rectors of Charlton – Charities – The Old Vestry and Parish School – Church Plate – The Old Account-books – Vestry Records – Village Law – The Charlton Guard – A Poor-house Wanted – Hanging Wood Robbers – Fossil-beds – Ancient Camp – Hanging Wood Lane – East Combe – Sir W. Congreve – West Combe Park – Charlton in 1848 – Little Heath – The Soldiers’ Mile – A Road through the Park – Bull Pit – Horse Infirmary – Charlton Common – Through the Wood – Pound Park – Graham’s Flower-show – The Village in 1800 – The Bugle Horn in 1875 – Departed Landmarks – The Gibbets – The Parish School – A Native Poet – The Churchyard Closed – The Cemetery – St. Paul’s – Holy Trinity – Dutch Almshouses – People – Rates and Rating – District Board of Works. Charlton Village in 1800. Two interesting sketches of the village as it appeared in the early days of the present century are here presented, Plates LXVIII (a) and LXVIII (b). The originals were entrusted to me by the late Mr. Saunders, before mentioned, who was born in 1800, and who stated that they quite agreed with his earliest recollections. It will be noticed that the cottages and footpath on the north side were at that time below the level of the road. This was consequent on an earlier improvement which had rectified the natural hollow of the surface and made the way smooth, but had left the houses at their original depth. These cottages have since been entirely replaced by modern houses and shops in proper trim with the highway, but we may see the former depression of the surface by glancing into the back gardens. Mr. Saunders told me that a man standing in the roadway could peep into the upper windows of the cottages. In the south view, beyond the Bugle Horn and the two butchers’ shops which supported it and are now absorbed into it, we see the Cage, in which Mr. Saunders and other young villagers of sixty years since have often sat all night on the watch for resurrectionists in the churchyard. The Cage and stocks were, as we have seen, abolished about 1842. “The origin of the name is doubtless ceorle, the Saxon term for husbandman, and ton, a town. Ceorl (from which charl and churl) meant a man, a husband and also a husbandman. It also meant a freeman, and was apparently the masculine gender of the generic “man.” Ceorl-boren was country-born. The term was also used to signify low birth; ceorl-folc were the common folk, and ceorl-cynge was king of the commons. Karl in the Danish, Swedish, and Icelandic, and kerl in the German, have gone through the same gradations. The common suffix ton, or town, was at one time applied to any kind of enclosure – the husbandman’s homestead standing alone, or in a garden fenced off from the waste, being each described as a ton or tun, which in time got applied to a cluster of cottages, a village, and all kinds of human settlements under the Anglo-Saxons. “Of the original parish church of St. Luke, Charlton, we have no distinct record, but it was probably a very ancient building. It may, however, be inferred to have been erected of chalk and flints (of which materials there are an abundance close at hand), for while the church was under repair a few years since, a portion of the old foundation walls was laid bare, and was found to consist of chalk and flints entirely. The earlier church appears to have been encased with brickwork when rebuilt by Sir Adam Newton in 1629. `Aug. 19th, 1732. On Sunday morning the Rev. Mr. Richardson, who keeps a school at Lewisham, going to preach at Woolwich, was attacked by a footpad in Hanging Wood, who robbed him of a guinea (leaving him but twopence) and then made off. June 2nd, 1762. Several people have been robbed this week in Hanging Wood, near Woolwich. One gentleman, belonging to the Warren, was robbed of three guineas and a half, and a medal. Three men robbed a boatswain of a man-of-war, near Hanging Wood, of his watch and ten guineas, but some gentlemen coming up, they took to the wood. Sept. 20th, 1783. On Saturday last as Mr. Young, surgeon, was riding towards Woolwich he was accosted by a genteel-looking young man, who entered into further conversation, and it was agreed to eat a chop together at Woolwich. Having passed a social hour or two, on their return the young man produced a pistol and demanded Mr. Young’s money, with threatened destruction in case of delay. Mr. Young, having no arms, was obliged to give up near twenty pounds.